The Unrepresented Nations and Peoples Organization (UNPO) delegation completed its visit to Hawai'i to look at the political, social and economic status of the Native Hawaiian people. It will present a full report to be released in time for the United Nations Sub-Commission on Human Rights meeting in August. Before leaving Hawai'i, the UNPO wishes to make known its conclusions regarding one specific aspect of its investigation, which is the Native Hawaiian Vote. Other conclusions and recommendations will be contained in the final report. From July 1-3 1996, the members of the delegation have listened to three days of testimony by representatives of Native Hawaiian organizations, individual experts, the Office of Hawaiian Affairs Trustees, State Legislators and others. 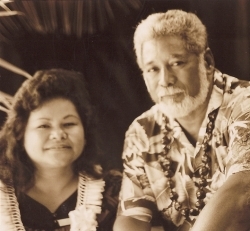 On Monday July 8 1996 they had a five hour meeting with the Hawaiian Sovereignty Elections Council (HSEC). UNPO is very concerned about the manner in which the 'Native Hawaiian Vote' is being conducted and about the effects this process may have to the cause of Native Hawaiian sovereignty. UNPO has found strong support among the Kanaka Maoli (indigenous Hawaiians) for sovereignty and for consensus building among the people. However the present initiative of the State is bringing disunity and confusion among the people whom it is supposed to benefit. The validity of the results of the vote must already be seriously questioned, because too many Native Hawaiians do not know what they are voting for or against, and the balloting system does not contain sufficient safeguards against possible abuse and fraud. UNPO is, therefore, urging the Government of the State of Hawai'i and the HSEC to cancel the vote, even at this late stage. The delegation believes that before the people are presented with an opportunity to vote on a process leading to sovereignty, Native Hawaiian organizations should be encouraged and independently funded to conduct education programs an all options for sovereignty. They should also be afforded the opportunity to develop consensus among the Native Hawaiians on a process to exercise their right to self-determination. UNPO believes that the vote, as it is currently being conducted, does not satisfy international standards for a 'free and informed choice', which are also adhered to by the United States. 1. There is much confusion about the Native Hawaiian Vote. Different names have been used, and are being used - such as plebiscite, referendum, vote, poll, survey, election - to describe the process without clarity or consensus on their meaning in the present context. The same is true for the free usage of the terms such as independence, sovereignty, and self-determination in HSEC information materials. Whereas earlier in the process official information describes the plebiscite/Native Hawaiian Vote as an exercise of self-determination, voters are now being told that this is not the case. And still, too many voters do not know what precisely they are being asked to vote on. 2. The formulation of the question on the ballot - "Shall the Hawaiian people elect delegates to propose a Native Hawaiian Government?" - does not give the people a real choice. Only one procedure is being proposed, but many voters feel they are actually voting for an outcome, namely, sovereignty. They fear that a 'no'-vote can be interpreted as a vote against sovereignty. This is all the more true because the suggestion is being made by the organizers of the vote that this vote could be the only chance to move forward on the issue of sovereignty. 3. Among many voters there is a feeling of suspicion concerning the true intention behind the State's initiative and the manner in which it is being conducted. The limited representation of HSEC, not having been elected, and some of its activities have fuelled some of these feelings of suspicion. The UNPO delegation does not take a position on whether the suspicion is justified or not, but believes that such a feeling among the people must be respected and addressed in a constructive manner. 4. The mail-in balloting system contains several flaws which could lead to fraud and which bring the results of the vote count into doubt. As one member of HSEC admits, the voting system is "not full-proof". There is no adequate system of verification to ensure that non-Native Hawaiians do not vote. This is especially true for persons mailing in ballots from the continental US. According to HSEC, evidence of ancestry is required only 'when available', and the Council 'counts on the goodwill of the people' in this respect. 5. Many Hawaiians have expressed the strong feeling that the vote should not be held at this time. In fact, this was reflected in a poll, taken in November 1995, which stated that 81% of the Hawaiians and part Hawaiians surveyed felt they needed more time and information. 6. HSEC has not maintained the neutrality that is required from an election committee. There is ample evidence that HSEC is publicly advocating a particular outcome (a 'yes'-vote). HSEC confirmed to UNPO that it is pursuing a 'yes'-vote and that the money is being used to that end. The conflict of interest of some of the members of the Council is also cause for concern. In effect, HSEC is pursuing a particular political agenda and seeking a legitimizing vote for it, using state money for this purpose. The UNPO delegation wishes to stress that it is convinced of the good will of the Council members in seeking ways of achieving Hawaiian sovereignty. It nevertheless has great concern that HSEC is not observing the basic rules of neutrality and fairness demanded of election or referendum commissions. If, despite these and other serious concerns, the State and HSEC do proceed with the vote, UNPO believes that this could raise tensions on the islands, regardless of the vote count. At the very least, the delegation urges the State and HSEC to make a clear public and unambiguous statement that the so-called vote is to be regarded only as a survey or a poll, and that it will not be treated as a vote, a referendum or a plebiscite. This means that the outcome of the vote would be given the same weight as other polls which have been conducted, and in the future may be conducted, but without any legal validity. * the Former Republic of Macedonia. Reports of the UNPO missions have been well received and, on several occasions, acted upon by the United Nations, the OSCE and their member states. UNPO is a fast-growing international organization of indigenous nations and peoples, non-self-governing or occupied states, and minorities. Its 52 member nations and peoples are from all regions of the world. UNPO provides a legitimate international forum and professional services for its members. UNPO extends support for the non-violent efforts of its members that seek self-determination and respect for human rights. Most important, UNPO member nations and peoples have developed the means to help each other and learn from each other. That is the context of the UNPO delegation's visit to Hawai'i. The UNPO delegation is headed by Mr. Lodi Gyari, from Tibet, who is Chairman of the Peace Action Council. Other members are Dr. Michael van Walt, General Secretary of UNPO, Mr. Menelaos Tzelios, representative of the Greek Minority in Albania and Assistant General Secretary for United Nations Affairs. The objective of this delegation's visit to Hawai'i is to look at the current political, social and economic status of the Kanaka Maoli in Hawai'i; to understand the possible effects of the US Public Law 103-150 (Apology Law) ; and to learn about the events leading up to and the implementation and the possible impact of the State of Hawai'i's initiative to hold a Native Hawaiian "Plebiscite" or "Vote." The information, insights, conclusions and recommendations of the mission will be published in the final report. The report, to be brought out in early August, will include conclusions and recommendations on a number of issues relating to the areas described above.